Various parts of this story are funny, heartbreaking, and revealing. Seeing how Amelia and Jacob cope with being fish out of water in the year 1861 is quite amusing at times, although experiencing what Ophelie lived through is tragic and horrendous. Learning about Victor is exciting because of potential future plot lines with his character. Traveling back to 1861 is a treat, as it’s obvious the author did extensive research on this time period – and I love anything having to do with time travel. This may be my favorite cover in this series yet – it’s beautiful! One of this author’s greatest strengths is character development and the way Amelia and Jacob struggle to cope with the devastating trauma they’ve experienced is heartrending, but feels very real. Although this is primarily their story, I enjoyed the addition of Finn, Ana, and Aleksandr and seeing how their own storyline may parallel Amelia and Jacob’s in the future – and Nic getting some page time is always a bonus. 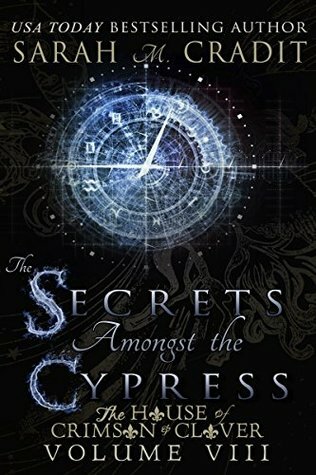 Secrets Amongst the Cypress is a powerful, compelling read, but upon reaching the conclusion, I felt as if something was missing – but I can’t put my finger on it. The book gives some spine-tingling hints of things to come in this series, but something felt incomplete. If you’re a fan of urban fantasy/paranormal, I can’t recommend this series enough – but start from the beginning! I received an ARC of this book from the author.